The belief that God eternally and unalterably decrees the election of one part of humankind and the reprobation of the rest has not aged well, but in the sixteenth and seventeenth centuries the doctrine of predestination was publicised and popularised to an extent unparalleled in the history of Christianity. Why was this? How successfully was the doctrine able to mix with other ideas, and to what effect? And did belief in predestination encourage confidence or despair? 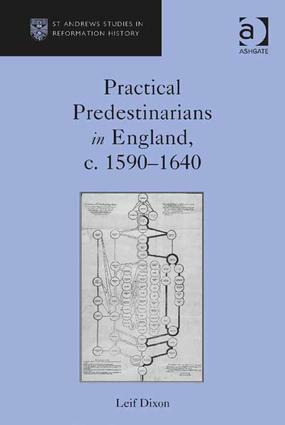 Practical Predestinarians is a study of the ways in which the doctrine of predestination was understood and communicated by churchmen in late Tudor and early Stuart England. It connects with debates about the 'popularity' of Protestantism during England's 'long reformation', as well as with the question of whether predestination tended toward inclusive or divisive, and conformist or subversive, applications. Intersecting with recent debates about the popular reception of Protestant preaching, this book focusses upon the pastoral message itself - it is therefore an investigation into the public face of English Calvinism. "In sum, Dixon’s work is written well, and deserves a hearing from anyone interested in this "central theological controversy"… Dixon’s work reveals the complexity of predestinarianism, and informs the discussion through the framework of the cultural crises and pastoral concerns inherent within the medieval/early modern English Sitz im Leben." "… I found this book to be a really stimulating read, and it has much to offer the historian, with Dixon having a talent for clarifying and explaining dense theological ideas.' Reviews in History '… Dixon's work should help reshape our understanding of how the doctrine of predestination worked in early modern England." "Dixon is to be applauded for recovering the positive import of the doctrine of predestination in this formative period of English Protestantism. He observes that "Even 'objective' modern scholars are prone to expressing their distaste for a doctrine which they often find to be depressing at best, and morally repellent at worst" (p. 3). Arguably, it is this factor which has most blinded modern scholarship to how the doctrine actually functioned. Dixon's work is, therefore an important corrective and a welcome addition to the St Andrews Studies in Reformation History Series." Contents: Introduction; Predestination in early modern culture: contexts and concepts; William Perkins and the search for certainty; God and Godliness in the thought of Richard Greenham and Richard Rogers; Thomas Wilson: an impractical predestinarian? ; Robert Sanderson and the politics of predestination; Preaching predestination, c.1603-c.1625; The theology of death and dying: predestination versus the ars moriendi? ; Bibliography; Index. Leif Dixon was a British Academy postdoctoral research fellow at the University of Cambridge, and has been a lecturer in early modern history at the University of Oxford.